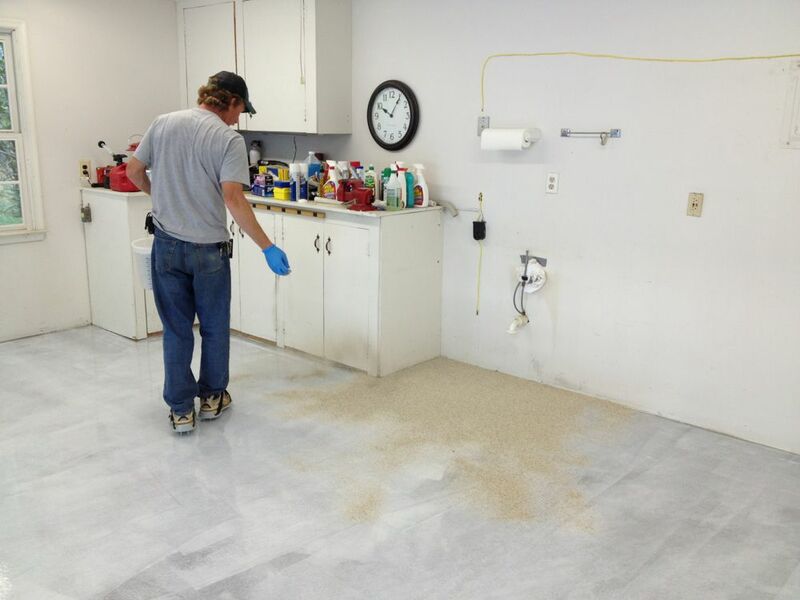 The first thing we do is prepare the concrete by making it rough to make sure we have a good bond between the concrete and the epoxy. We can do this a few different ways, but the most common way is to grind it with our diamond grinder. 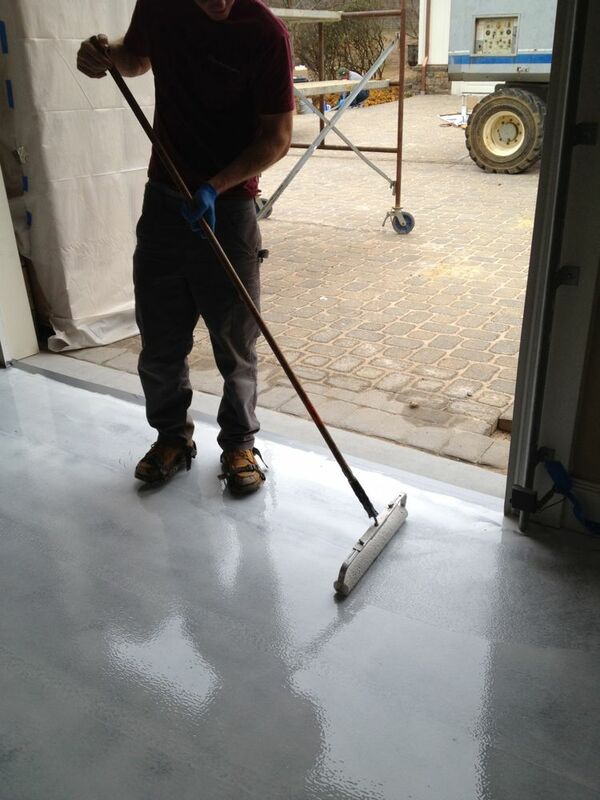 After the concrete is properly prepared, we apply a first coat of epoxy. 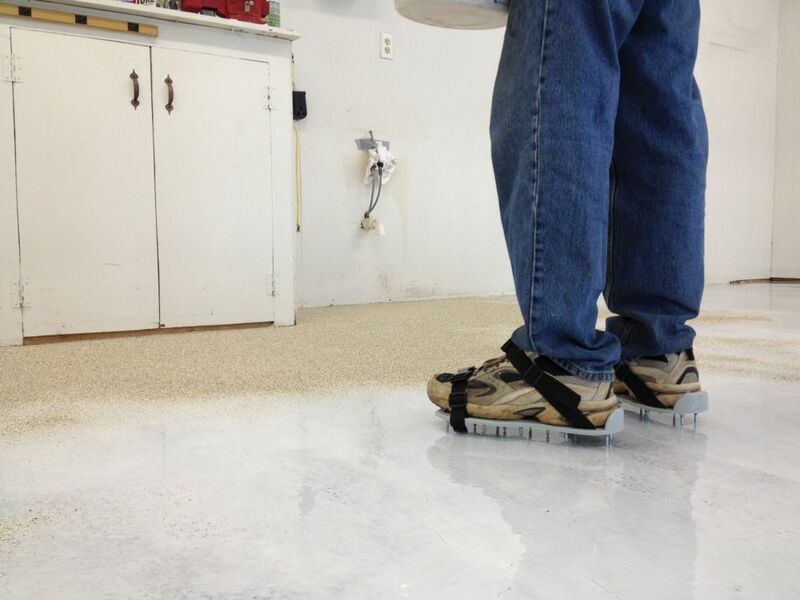 Our epoxies have a chemical hardener in them, so they set up very quickly. 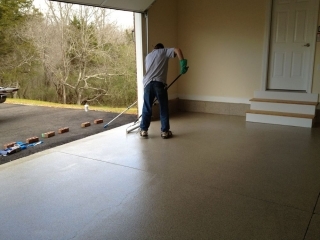 We typically will have one or two people applying the epoxy with a squeegee. A third person will then put metal spiked shoes on so that he can walk on the wet epoxy and back roll the entire floor with an 18″ roller. 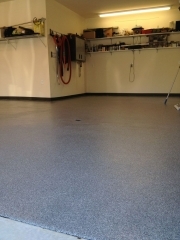 After the epoxy has been applied, we walk on the epoxy again with metal cleats, and broadcast vinyl chips across the entire floor. We typically will broadcast about 20 pounds of chips per 100 square feet. 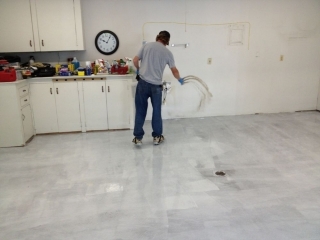 The idea is to broadcast as many chips as the epoxy floor will absorb. 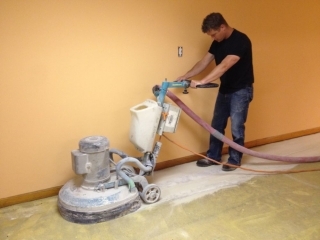 The next day, we return and run a floor scraper across the entire area to remove any loose chips. Then we will sweep and vaccum all of the loose chips up and recycle them for the next job. After the floor has been throughly cleaned, we apply another coat of clear epoxy or clear polyaspartic urethane on top of the chips. 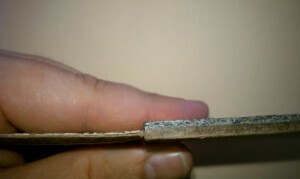 This is applied in the same squeegee/back roll method as mentioned above. 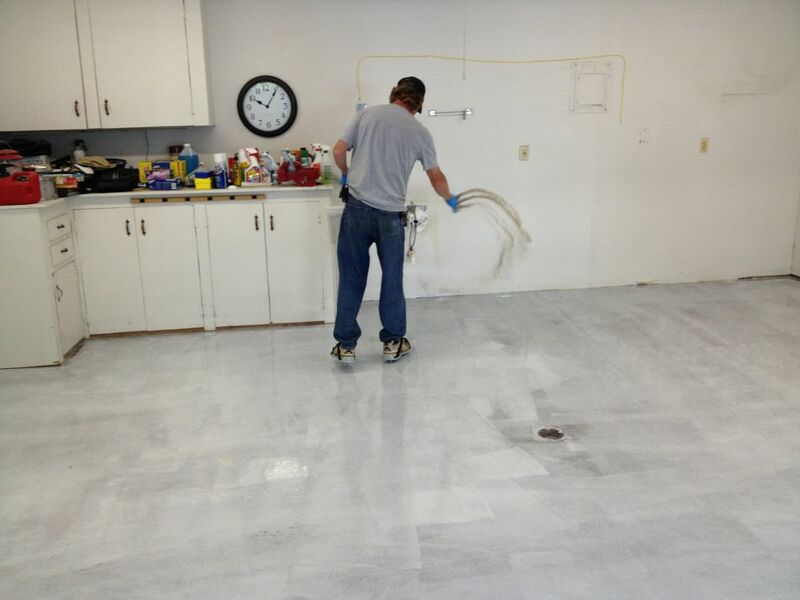 We let this coating cure over night. If we used polyaspartic urethane, then the job is complete. 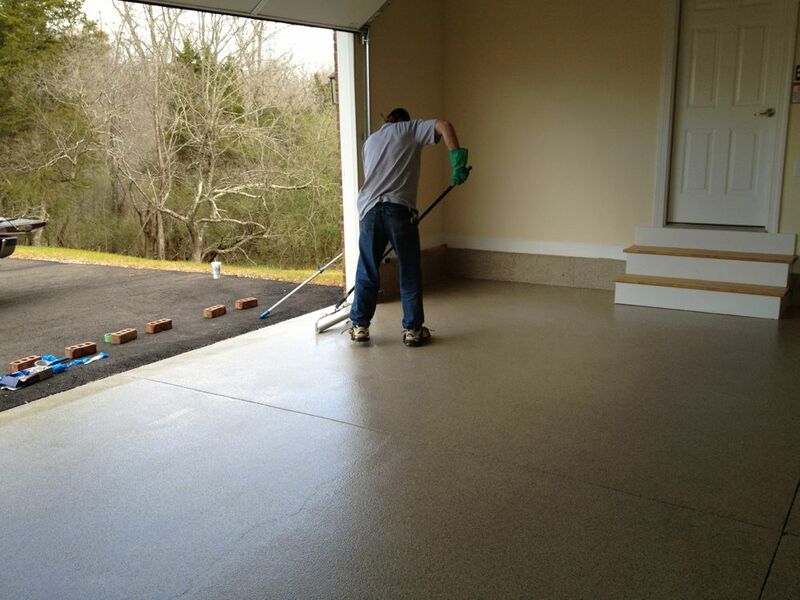 If we used epoxy, then we will typically return to apply a final coat of urethane.